You feel like, "You are winning more than your actual STATS.” or “You are hitting more CRICKET numbers than before.” This app shows your darts improvement more clearly even minor ones. Knowing your skill and performance characteristic will make your practice more effective. In addition to RATING and STATS, your game results remain available longer. Long-term record of your performance is available. You can create a group of your darts friends, check group members’ rankings and compare your performance to theirs. You can also find “Currently playing members”. Add your high-priority items to Dashboard and monitor them. 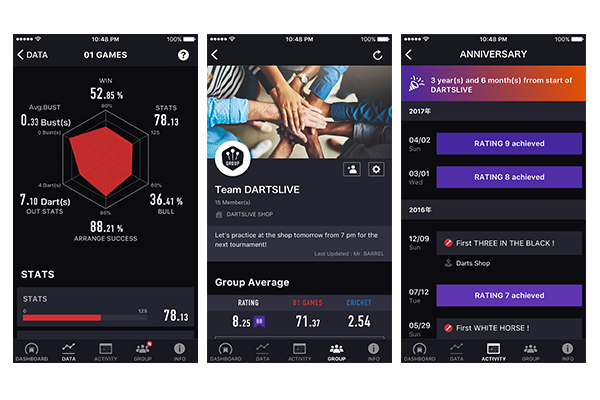 How many years have passed since you first played DARTSLIVE? The time you hit your first HAT TRICK and etc.